Lounge by the pool and soak in those calm, island vibes. The quieter second pool features a gentle waterfall. Spacious resort residences give you lots of space to unwind as a family. Set on a lake, everywhere you walk offers something beautiful. Grab a casual meal at the pool bar and grill. Head to the deli and store for groceries, sandwiches, and necessities. 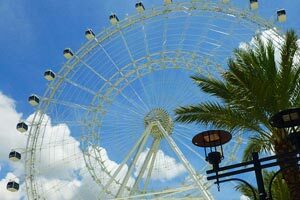 Get free shuttle service to SeaWorld, Aquatica, Discovery Cove, and Universal. There are tons of kids activities at the kids club, kids pool, and playground. Grab lunch by the pool at Coral Reef Bar and Grill. Enjoy the view from your balcony while you plan out the rest of your day. Unwind with a soak in the jetted tub (in all 1- and 3-bedroom condos). Hilton Grand Vacations SeaWorld - Right across the street from SeaWorld®, this 33-Acre Bermuda-Themed Resort has a soothing island vibe that will instantly put you in vacation mode – you’re welcome. Don’t bother unpacking once you get to your condo, just get changed into swimsuits, sunscreen-up and get ready to party. HGVC SeaWorld has three pools and five hot tubs including a waterfall-featured main pool and hot tub. Go for a swim or unwind with the latest issue of People magazine and a refreshing drink from the poolside bar and grill. Little ones will love the two kiddie pools. Catch a flick at the fifty-seat movie theater or a “dive-in movie” at the pool. Kids will have a blast at the children’s activity center and the covered playground. Studio condos sleep two guests and have a Queen or King bed. Kitchenettes feature granite counter-tops and have a mini fridge and microwave, perfect for preparing the basics or heating up leftovers. One- to three-bedroom condos sleep two to eight guests. Full kitchens with granite counter-tops have everything that you need to whip up anything from sandwiches to multi-course meals. Hit up the on-site market/deli or the nearby Publix to stock up on groceries. Surprise the kids with top-your-own pizza night and let them go wild. Declare the pizza with the most unusual toppings the winner and put the pizza artist in charge of the remote. Flat-screen TVs have premium cable channels HBO, CNN and ESPN. Gather everyone on the couch with a selection of snacks and get ready to be entertained. Be sure to pack some of your favorite movies from home, DVD players are perfect for family movie night. Show off your multitasking skills and throw in a load of laundry in your in-suite washer/dryer while the movie is playing. Hilton Grand Vacations SeaWorld provides a free shuttle to SeaWorld® and Universal Orlando®. Experience the South Pole through the eyes of a Penguin at SeaWorld’s Antarctica: Empire of the Penguin ride or see the penguins first hand at the Antarctica: Empire of the Penguin habitat. The kid-friendly roller coaster, Shamu’s Happy Harbor will be a hit as will the Flamingo Paddle Boats. See an animal show featuring dolphins, sea lions or orca whales. Universal Orlando® is a must for movie fans. It’s made up of two theme parks Universal Studios® and Universal’s Islands of Adventure®. With rides that feature E.T., Jurassic Park®, Shrek®, Transformers® and an entire land devoted to Harry Potter, it’s a can’t-miss experience. Disney fans will love Walt Disney World’s® Magic Kingdom®. It’s home to classic attractions such as It’s a Small World®, Haunted Mansion® and Pirates of the Caribbean®. Dine in the Beast’s castle at the Be Our Guest Restaurant® in New Fantasyland®.